1. Which events are significant enough to justify the user's attention? If we notify people about things that are irrelevant, they will start ignoring notifications or even turn them off. On the other hand, if we don't notify them about what's important or updates fall through cracks, people will not trust the system. Finding balance is essential here. 2. What's the best way to deliver notifications? A lot of things have changed since ActiveCollab v1. As the system grew and started sending more emails, the average web user's “email tolerance” has dropped significantly. It became obvious that email as the only notification mechanism had no future. Enter Notification Center in ActiveCollab 4. This feature added notifications to the application interface and people could opt out from receiving emails. Important notifications (like @mentioning a person in a comment) were still emailed to users, but they could track everything else in the system without having their mailbox bombarded with messages. When there are multiple notification channels, and one of them is invasive, there's always the decision whether to use that channel for a particular notification. 3. Should we aggregate or deliver notifications separately? From a system perspective, it gives us the opportunity to combine multiple notifications in a single message. One example is a reminder that something is due today. Instead of sending a notification for every task that is due, we can aggregate them into a single message and Morning Paper is the perfect delivery method. 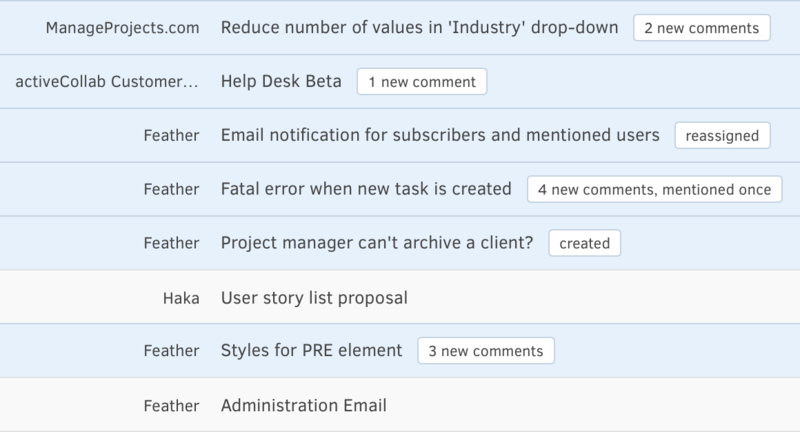 With these questions in mind, our team set to improve notifications in ActiveCollab Feather. Version 4 introduced enhancements to how notifications are sent, so we already had a good foundation to build on. We then asked ourselves whether ActiveCollab should show the number of unread notifications ALL the time? After several discussions, we concluded that we should not implement it like that. ActiveCollab is a productivity application, and we respect our user's decision to be in a particular mindset. They are probably working: completing an assignment, writing a note, discussing something important, etc. When doing that, users can be interrupted only if they made themselves available for the interruption, and only if something really important happened. ActiveCollab has a perfect channel for this, and it's not the web interface. It's email. When a user has their email client open, they will be notified about important ActiveCollab events. If their email client is not open, they don't want to be interrupted and they will not see any notifications until they are ready. Once we agreed on this, the little bell icon from the upper right corner was gone and we moved notifications to the My Work page. The next step was to implement notification aggregation. In ActiveCollab 4, each notification had its own line on the Notifications page. This meant that you could have many separate notifications about the same object, and each would consume a new line in the notification stream. Instead of repeating the same object every time a user updates or comments it, this design shows an object only once and combines what's new since you last opened it. When you visit the object and return, it will be greyed out. The list is sorted so that recently discussed or updated objects appear at the top. All other notifications are listed on the Subscriptions page, and can easily be accessed through the Subscriptions widget on the My Work page. There are many other improvements to notifications in ActiveCollab Feather: we redesigned the email template, reworked every single notification that is sent, extended Morning Paper with new sections and much more. We'll talk about these enhancements in future posts. Notifications are a really important aspect of our collaboration tool. It's easy to get carried away and flood users with too much information, or skip events that are important to them. Both mistakes can reduce a user's trust in the system. We spent a lot of time working to avoid these pitfalls and implemented a notification system that respects the user's needs.